Rev. 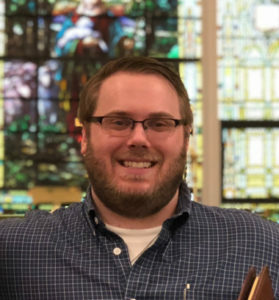 Jesse Ruch is currently pursuing his MDiv from Drew University, he is an IT professional in transition to Pastoral Ministry. He graduated from Stockton University with a B.S. in computer science. Originally from Ocean City, NJ, Jesse has served various volunteer ministry positions including youth, small groups, camping ministry and A/V. He believes that God has called the church to be the hands and feet of Christ here on earth. When out of the office, Jesse enjoys camping, cooking and coffee. Please do not hesitate to get in contact with Rev. Jesse Ruch. To contact Rev Jesse, please click here.